It’s not what I do, it’s what I am. Believe me, there is a difference. Pressing license plates is something you do. Working as a grocery store cashier is something you do. Unloading trailers at UPS (which I did for three years, and in my mid-forties no less) is definitely something you do. Things that you do don’t necessarily define you they’re just…well.. things you do. If you pick your nose sometimes, we can probably agree there are better ways to spend your time, and there are definitely better ways of getting a date. But would it be fair to say that picking your nose in broad daylight is who you are as a person? Well that would just be mean. But telling stories, creating music, drawing portraits, these are the sorts of activities that define a person. The stories you create in turn tell us your story, and your story tells us about you. The songs you create are nothing more than sonic stories, so the same rule applies. Creator begat Creation, which begat Creativity. Or something like that. That being said, I like to think there’s something a little extra special about those of us who create in and about Detroit. 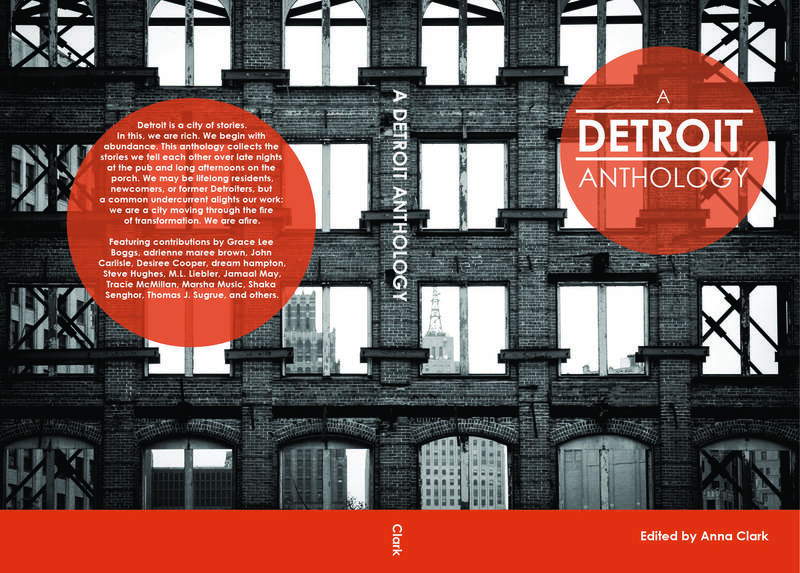 Apparently so does Anna Clark, who edited A Detroit Anthology, a truly impressive collection of Detroit authors writing about our very own beloved Detroit. Literary outcasts sharing experiences of a cast out once-upon-a-time metropolis. And thus we shine. “Detroit is a city of stories. In this, we are rich. We begin with abundance. This Saturday night, if you happen to be in the ‘D’ and want to get a more up-close-and-personal vibe of what this is all about, check out the book launch party. More details on that here. And yes, I’m lucky enough to have a piece of mine included in the volume. Full disclosure and all that. But believe me when I say this is a piece of Detroit literature that truly matters for those who truly want to understand the city from the inside out. If you want to know what my neighbor thinks about me, then ask my neighbor. But if you want to know who I really am, then pull up a chair. This is gonna take some time.